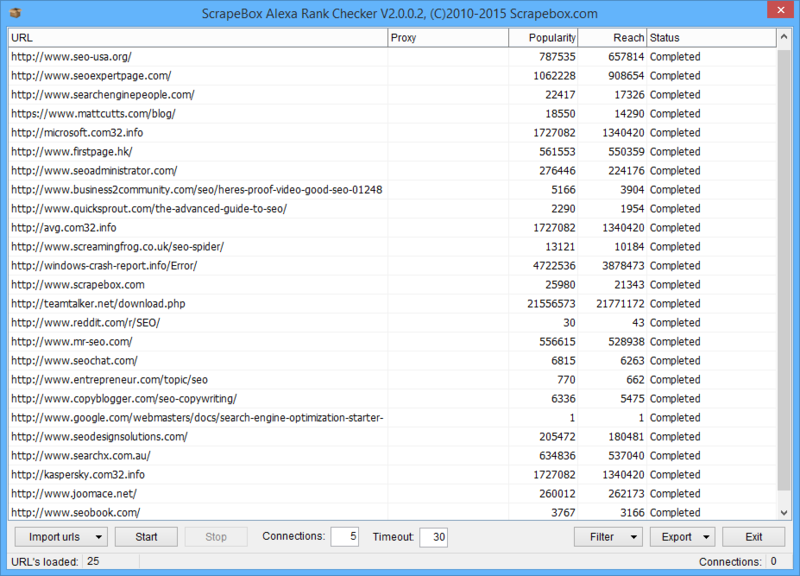 If you need to bulk check a list of domains to obtain their Alexa rank for competitor analysis, purchasing advertising or to simply keep records of all your own domains then ScrapeBox contains a free Alexa Rank Checker Addon available for download in the ScrapeBox “Addons” menu. Once installed, you can load a list of domains harvested from ScrapeBox or load domains from a file, you can set how many concurrent threads you wish to use when checking and optionally use proxies which alternate with every domain checked. The addon is multi-threaded and can retrieve the Alexa ranking of 100’s of domains per minute. One the results are fetched, you can sort the data in the tool, remove sites with a popularity lower than a specified number or export the data to tab separated .txt file, a .CSV file or in .XLSX format to use in Excel. This is a great solution for people interested in finding sites in their niche with the most traffic to approach for advertising opportunities, or simply to get ideas on how to obtain more traffic. View our video tutorial showing the Alexa Checker in action. This is a free addon included with ScrapeBox, and is also compatible with our Automator Plugin.